Inspiration can strike at any time. Today it happened for me at the dry-cleaner just after 7:30 a.m. when I picked up my shirts and a suit. My dry cleaner had a little newspaper sitting there by the cash register. At first I laughed. I thought to myself how foolish and what a waste of time it is for a company to publish a little newspaper. But then a headline jumped out at me and the article that followed blew me away. 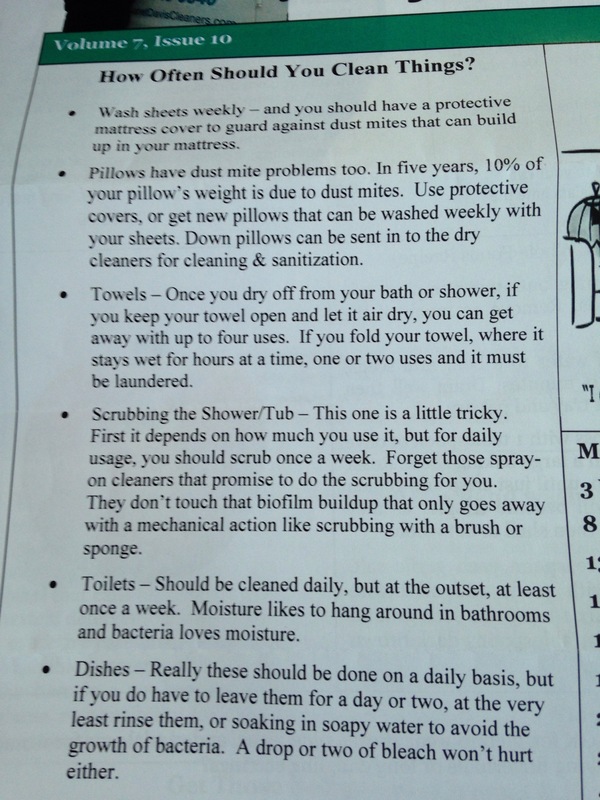 I wash my bed sheets weekly. Check. We wash towels in our house, it seems, daily because the standard practice of my three children are to just drop them on the floor after they’ve been used and by the time my wife or I find those towels, they sometimes already smell musty, so into the washer they go. Oh, and my one daughter has no concept of “my towel” and will use whichever towel she can reach. But …the pillow? Should be washed weekly(ish)? I thought I was good replacing my pillow once a year, but according to the cleaning experts at my dry-cleaner and their intrepid reporters, I’m laying my head down nightly on a germ factory and dust mite cemetery. Today begins my 21-Day Blogging Challenge with Jeff Goins. My goal is to take simple things and blog about them, and offer a lesson. What did I learn today? Respect other’s voices. Hell …I’m a guy with a blog and was part of founding spunkybean, a website about TV shows. And I want people to read and marvel at my wit. This newspaper at my dry-cleaner is someone else’s fun/good idea. A co-worker telling me about their commute or their recent conversation with a client …there’s a reason they’re telling me and I should listen. I’m going to do a better job of respecting others voices and their stories. I’m going seek opportunities to learn and grow in more moments in my life. So today, I didn’t just learn I should wash my pillow more, but I should lower my defenses and open my eyes and ears more. ← Living Deliberately. Blogging Intentionally. wooden furniture and teak wood. We shall always be willing to offer and create a quality furniture that is good that you would like. doesn’t take part within the compact.